I went up the cliffs to 65:61 and backed down the cliff face. I tried jumping the first time, but overshot the cliff ledge. Just walk off the northernmost point of Tel'aar. No glider or slow fall necessary. Go into Telaar, walk to the edge @66,61, then drop down onto the "shelf" down below. You will need to collect Abu'gars Lieblingsköder Abu'gars Lebenskraft Abu'gars beste Angelspule BEFORE you can get the quest. Don't stand on the ledge too long because there is a patrol that comes by and will aggro on to you. I was able to loot this item as Alliance, do you know if it has any use for ALLIANCE? When you have all 3 items you can hand them in at Abu'gar at 67,56 in Stonecrag Gorge in Nagrand, in return he will become your follower at your Garrison. For those asking about Alliance use of this item, the follower is available to both factions. Can this be a reference to the swedish fishing equipment company Abu Garcia? Kardall posted this map on another one of the items it is perfect for finding them. I just stood across the river on the road, and then used Avianas Feder to land on the ledge. Abu'gars Lieblingsköder, Abu'gars beste Angelspule, and Abu'gars Lebenskraft for Abu'gar. To obtain Abu'gar you must travel to Nagrand and collect three items. These items then can be handed in to Abu'gar. Speaking to him he will offer Abu'gar and reward Anhänger: Abu'gar. This item is part of a set of 3 treasures found in Nagrand. Once you've found all three you can turn them in and gain a follower for your garrison. Abu'gars beste Angelspule: Found at (85,38). This is beside a small pond up the hill northeast of Wor'var. Abu'gars Lebenskraft (65.8, 61.1) is found on a ledge partway down the cliffs to the north of Telaar. From the most northern part of Telaar, look down over the cliff and you will see a ledge sticking out with a tent on it; jump down and you'll find the item. (I didn't manage to find a way up to the ledge from below.) Now, of course, you can probably fly there. When you have all three items, go visit Abu'gar (67.2, 56.0) who is down by the water in Stonecrag Gorge. He offers the quest Abu'gar which gives you a level 98 Abu'gar. Sadly (and a bit strangely) he does NOT have the fishing trait. Abu'Gars fishing gear? Must be a cameo from the fishing equipment brand Abu Garcia. For those who don't have any boosts and just want to get the item with no fuss. 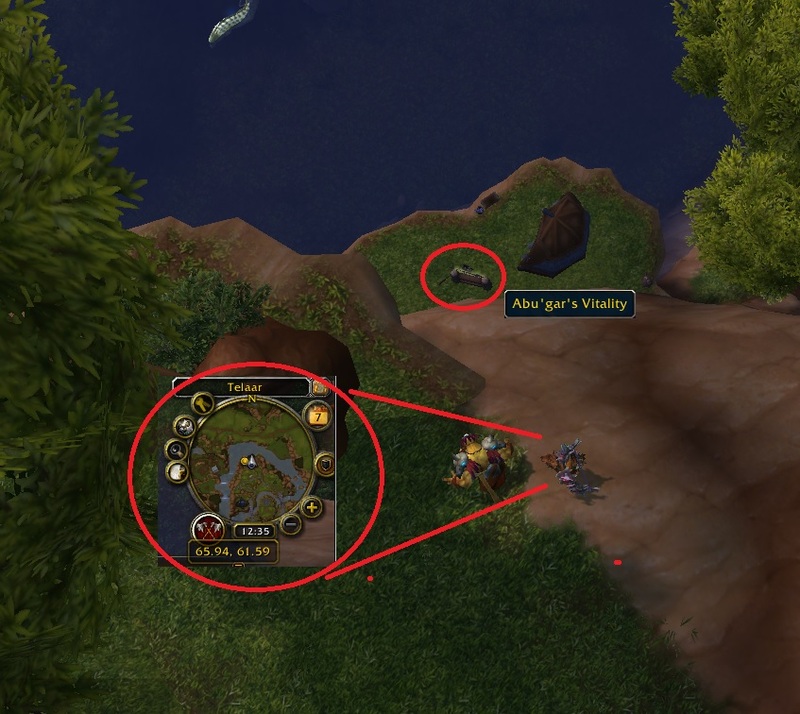 Just head to Telaar (Nagrand Zone) and enter from the North side and go to the first A in Telaar on your world map. Get off your mount if you are on one as that would most likely send you out too far and overshoot the target area. Jump down and loot the item. Done. I was worried about doing this as a Horde, reading all the guides saying "just run into Telaar and jump down..." etc. I am on a PVP server, and a healing class so I didn't really think a squsihy like me could do this but I'd like to point out that it IS possibly, in case it's not clear from the other posts. You can do it, as you're basically skirting around the very edge of Telaar. There's one guard you could annoy, but he's easy to avoid, and a couple of wolves spotted me but they were really easy to kill. The easiest way to get this is through the Iron Horde camp, just south of Telaar. It is on the ledge, by what appears to be a small camp. 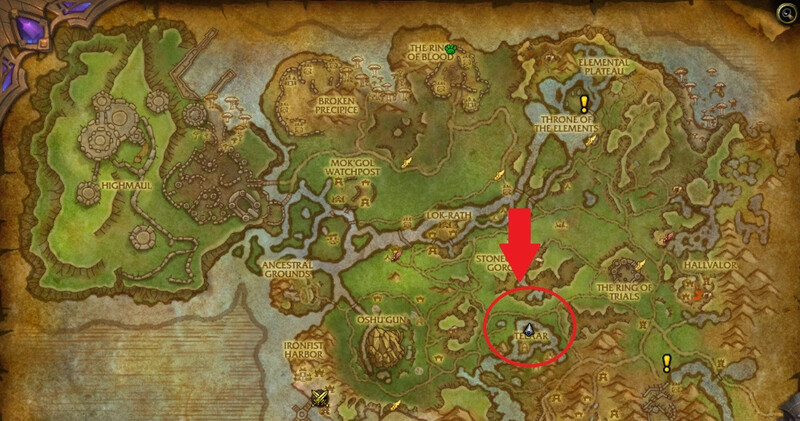 It's close to where you do the mount quest with the wolf, if that gives you an idea without having coords. Anyone else unable to click it? First time here, I've reloaded twice, and double checked via video that I'm in the right spot. Really lame. The follower you receive can't even be assigned to the Fishing Shack. if this item does not show up at its coordinates, try checking your bank. maybe you put it there. "Eine ausgezeichnete Angelrute, hergestellt von dem Troll Abu'Gar. Ohne eine Spule ist sie jedoch relativ nutzlos."